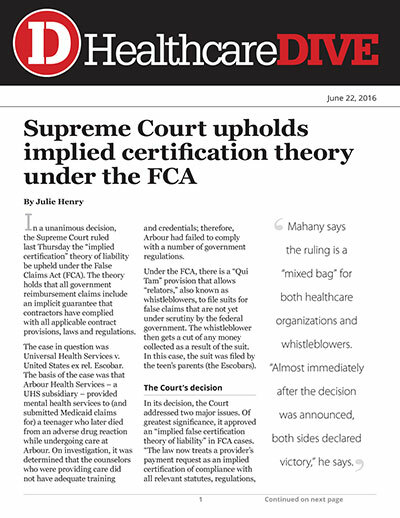 In a unanimous decision, the Supreme Court ruled last Thursday the “implied certification” theory of liability be upheld under the False Claims Act (FCA). The theory holds that all government reimbursement claims include an implicit guarantee that contractors have complied with all applicable contract provisions, laws and regulations. The case in question was Universal Health Services v. United States ex rel. Escobar. The basis of the case was that Arbour Health Services – a UHS subsidiary – provided mental health services to (and submitted Medicaid claims for) a teenager who later died from an adverse drug reaction while undergoing care at Arbour. On investigation, it was determined that the counselors who were providing care did not have adequate training and credentials; therefore, Arbour had failed to comply with a number of government regulations. Under the FCA, there is a “Qui Tam” provision that allows “relators,” also known as whistleblowers, to file suits for false claims that are not yet under scrutiny by the federal government. The whistleblower then gets a cut of any money collected as a result of the suit. In this case, the suit was filed by the teen’s parents (the Escobars). In its decision, the Court addressed two major issues. Of greatest significance, it approved an “implied false certification theory of liability” in FCA cases. “The law now treats a provider's payment request as an implied certification of compliance with all relevant statutes, regulations, or contract requirements, says Brian Mahany, a healthcare fraud expert and whistleblower claims lawyer. Dr. Paul Kalb, head of Sidley Austin LLP’s national healthcare practice and co-leader of its global life sciences practice on the Universal decision, says it’s no surprise that the Court generally upheld the viability of the implied certification theory. “While there is no clear textual basis for that theory, courts have been applying some form of that theory since the False Claims Act was adopted, and there was no going back,” he says. According to Kalb, what’s more significant is that for the first time, the Supreme Court imposed real limitations on implied certification. Based on the Court’s decision, for a claim to be considered false or fraudulent under the implied certification theory,” the regulation or contractual provision impliedly violated be must be “material” to the government’s payment decision. “In so holding, the court plainly rejected the government’s more expansive reading of the law,” says Kalb. Mahany says the ruling is a “mixed bag” for both healthcare organizations and whistleblowers. “Almost immediately after the decision was announced, both sides declared victory,” he says. According to Kimo Peluso, a litigation partner at Manatt, Phelps & Phillips LLP who regularly handles healthcare litigation and government contract disputes, although the Court upheld the general theory of implied certification, the ruling “sets a fairly high bar” on what constitutes fraud by omission in these types of cases. “Under this standard, it is going to be hard for the government or a relator to argue that a silent omission about a regulatory violation is fraudulent unless the government has a track record of denying payments over that very type of violation,” says Peluso. Kalb says the ruling “shifts the battleground in FCA cases” from whether the implied certification theory is valid to whether the particular rule purportedly breached is material to the government’s payment decision. Bret Bissey, senior vice president of compliance services at MediTract, says due to the complexity of this case, it could be several years before the full impact of the decision is known. In the meantime, Bissey says top priorities for all healthcare organizations should be to make sure that appropriate resources are dedicated to compliance efforts and that proactive compliance efforts are ongoing. Geoffrey Kaiser, a partner in Rivkin Radler LLP’s Health Services Practice Group, says from now on, healthcare organizations will need to be more attentive than ever to legal requirements that could be deemed material to government payment decisions. He also says organizations will need to bring a heightened degree of diligence to ensuring organizational compliance and integrity of claims submissions.